One-third of Earth's fresh water is trapped as ice in mountain glaciers and ice sheets. Ninety-nine percent of that ice is in the ice sheets of Greenland and Antarctica. The remaining one percent is in mountain glaciers, in Canada, Alaska, Russia, Patagonia, high mountain Asia and elsewhere. But when we examined those glaciers with the original ICESat from 2003 to 2009, we found that they contribute just as much to sea level rise as the massive ice sheets. We haven't been able to update that study since ICESat retired. Other instruments in space that measure ice sheet change, like GRACE and CryoSat-2, are too blunt to resolve the changes beyond ice sheets. So we don't know whether the rate of ice loss in these glaciers has held steady or not. And it's not just a sea level story – the people who depend on those glaciers as a source of water during warm, dry periods want to know if we're losing that reservoir faster than we thought. Once these ICESat-2 data starts flowing and we understand it, we're going to be able to probe the Earth like we haven't before. We've never had an instrument with this kind of precision. What I'm genuinely most excited about, though, is the future graduate student that will discover the potential of the data to explore the workings of the Earth system in ways that we haven't expected. The East Antarctica ice sheet is huge, it's about the size of the continental U.S. It's thick and relatively slow-changing compared to West Antarctic ice, so we need extremely precise measurements of height in order to detect the change that's occurring. You might say, "Oh, if it's not changing that much it's not a big deal." But when you scale it up across the entire ice sheet region, that small change can become a very large amount. ICESat-2 is really going to help us nail down what's happening over East Antarctica because it has collects more data, it repeats measurements more often, and will be capable of measuring small height changes with unparalleled precision. We'll also have a much longer record of change once it's combined with the first ICESat measurements collected 15 years ago. The next step will be accurately slicing up the observed height change to see where it comes from – is it from snowfall, is it from changing ice behavior, is it from bedrock uplift? We know from GRACE satellite data that there are large portions of East Antarctica that are getting dumped on with snowfall, so it'll be interesting to see if ICESat-2 will be able to tell us anything about these events. To me, I feel like my work is just starting. I love ice shelves, where the ice sheets leave land and float in the ocean. 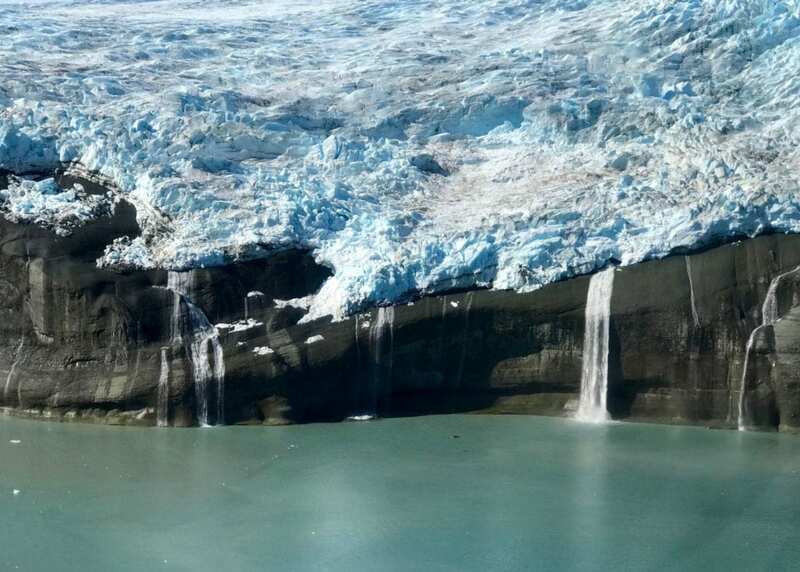 There's floating ice in the fjords of Greenland, but that's nothing like the massive ice shelves of Antarctica, which in a couple cases are the size of Texas. These things act as corks for the West Antarctic ice sheet -the ice sheet we're most worried about. The ice shelves are floating, they're going up and down with the tide. One in particular, a big chunk of ice the size of Texas, is going up and down, six to eight meters a day. It's awesome. And you can map the ice shelves based on that. We draw a line between regions where there's no tidal motion in the ice, and where there is. This locates the grounding zone, where the ice shelves are attached to bedrock below the ice sheet. We did that with ICESat, and we'll do that with ICESat-2, and see if the grounding zone has retreated. The floating parts of the ice shelves are already accounted for when we calculate mean sea level changes. But when the grounding zone retreats, you're putting a new chunk of ice into the ocean system. What I'm really excited to see are the month-to-month changes in sea ice thickness, because we didn't have that with the first ICESat. We had a couple of data points a year – snapshots in the fall or spring – which was a good starting point. But I'm more interested in the seasonal progression throughout the year. Besides fall and spring when the sea ice grows, no one knows what ICESat-2 data is going to look like in the summer, and what exciting new things can be done with the data. Also, right now there's a lot of assumptions made about how snow accumulates on the ice over the year. With ICESat-2, we should be able to see things like the effect of a passing storm. We're going to see more of details of the processes that drive change for sea ice on a monthly scale and relate this to changes we are seeing over the long-term. There'll be a lot of work to be done to turn these data into nice geographic maps of sea ice thickness. It's a new measurement concept that we're going to have to figure out. And sometimes that stuff surprises you. One of the really exciting things we were able to measure for the first time with Operation IceBridge flights is ridges on the sea ice. Areas where the ice is getting crushed together, and producing pressure ridges that can be a couple of meters high. With ICESat-2, it'll be the first time we can measure these ridges across the entire Arctic. I don't know what the data will look like for these pressure ridges, but I'm going to be looking for evidence of them straight away. Other satellites measure the drift of sea ice, and tell us how fast it's moving. We know in the Arctic, the ice has been drifting faster over the last 20 years. We also know that it's not getting windier, so the question is why is the ice moving faster? One theory is that these pressure ridges are becoming more common. They basically look like a triangle – the top part on the ice surface is called a sail. So it'd be like putting up more sails on your boat, and the more sails you have the faster you'll go. We want to test that hypothesis for Arctic sea ice. The most interesting region to me is the Southern Ocean and its ice cover. It's really an area that has not been studied very well. With ICESat-2, we should be able to see the entire seasonal sea ice cycle in the Antarctic, and shed a lot of light on how thick the Southern Ocean ice cover really is. If you want to do big picture science, you have to to collect data over a lot of ice. There's a conundrum because the Arctic sea ice is shrinking, but the Antarctic sea ice was sort of expanding – until 2015, and then there was this big drop associated with El Niño. We don't know the exact reasons, but we have some ideas why that is the case. The ocean around Antarctica is affected by the Pacific, Atlantic, and Indian oceans – so the changes from global warming may be masked by the changes in neighboring oceans. ICESat-2 will tell us a little bit more, in combination with other measurements, about how the ice cover is responding to changes in the ocean and changes in the climate. What I'm really most excited about is seeing these data come in at such a high resolution. We're taking measurements every 70 centimeters (2.3 feet), and when we combine data points the resolution will be phenomenal. You'll see the topography across the entire Arctic and the entire Antarctic with unprecedented accuracy. Over sea ice you'll see all these gaps and ridges, and discover just how rough that remote ice is. Over glaciers you'll see crevasses and calving fronts. It's more than just the surface heights and sea ice thickness that we'll be able to study. The data over land is going to be interesting as well. What will the data look like when ICESat-2 flies over D.C. or New York City? And I'm curious about if we can see ocean waves, or even waves in the Chesapeake Bay, right in our neighborhood. There are other ocean topography missions out there, but none has the resolution to see actual waves. The data quality of ICESat-2 will be so much more advanced than what we've had before, and the resolution will be so much higher, there will be so much room for discovery. I can't wait for the science community to fully explore the data.